Vincent Security | Are Plantation Shutters REALLY Secure? Are Plantation Shutters REALLY Secure? Plantation shutters can finish a room amazingly well. Rows of slats beaming natural light aesthetically through your windows is one thing, but are plantation shutters really secure? Yes, they are. What are plantation shutters and what do they do? A window shutter is a fixed interior or exterior window covering, which consists of a frame with vertical rails that support louvres. Louvres on shutters are horizontal slats that are angled in such a way that sunlight and / or rain is directed away from windows to improve the comfort and practicality of a room. Louvres on window shutters can be fixed in one spot or adjustable. An adjustable type of shutter can be altered to vary the light coming into your room. Shutters also act as a visual barrier on your home when they are closed. Now, plantation shutters may conjure up images of a tropical cabin’s bi-folding doors opening up to white sandy beaches and turquoise blue seas. Here, the only intruders you’d need to worry about would be local macaques steeling your bananas! But holiday huts aside, plantation style wood or faux wood window shutters can be used on your home for both aesthetic and safety reasons. Both traditional and plantation style shutters have advantages for homeowners; they both offer privacy, security and protection from the sun’s rays. The main difference between traditional shutters and plantation shutters is primarily the width of each louvre. 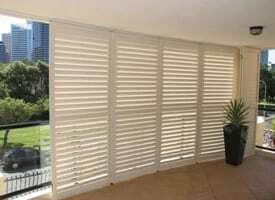 A plantation shutter louvre is typically wider than the traditional shutter louvre. Plantation shutters originate in the American South. In the 18th and 19th centuries, America caught onto a shutter trend seen in Europe where, in some cases, shutters were installed instead of glass to secure homes. Window coverings with louvres much wider than traditional shutter forms were fixed to the outside of large American manor homes in plantation estates, hence the name ‘plantation shutters’. In the 1950s, homeowners with large Californian homes that featured sizeable windows looked for indoor window coverings with wide louvres to be able to see out and manage the area’s famous bright sunlight. Wide-slatted plantation shutters proved to be the best choice for new Californian homes because wide louvres can be opened up for outside viewing and closed at night for privacy and security. Before long, other American states with sub-tropical and arid climates caught onto the suitability of plantation shutters. ‘Plantation shutters’ were also known as ‘Californian shutters’ by this time, and quickly become popular. Wide louvred window coverings soon became widely used around the world in warmer climates, including across Australia. Back in the day, plantation shutters were used for both decorative reasons, to act as protection from the elements and to add an extra form of privacy and home security. Such window coverings are still used for the exactly the same reasons today. Not all plantation shutters are made with real wood, although many window coverings may look like timber. Synthetics, vinyl compound and aluminium can be used to make secure and stylish plantation shutters for your home. Plantation style shutters made using timber offer a light weight option for your window, and can be tailored to your window shape. Real wood also provides a vast range of colours using stains to suit your styling needs. Imitation wood plantation shutters look just like real wood, and definitely offer practicalities for certain rooms in your house. Faux wood is best used for rooms where you will find a lot of moisture, such as bathrooms where timber may not have the longevity of imitation. Poly plantation shutters are great for rooms that experience drafts. PVC shutters are actually really good for insulation, because they are hollow and trap the air inside, unlike solid wood. Metal plantation shutters are not only strong, but give a sleek and polished look to your home. Vincent Security aluminium security shutters are powder coated, which means they won’t warp or change in Queensland’s climate. Safety and security is important to you and your family, which is why window shutters are such a smart choice for any home. When fitted correctly, plantation shutters can add an extra level of security to your home . Late at night when your children are in bed and you’re locking the doors, just close your shutters as well. Potential intruders will be deterred, with no visible glass to break or locks to crack. If your home is without shutters, it is far easier for strangers to see into your private space, and really, who wants that? Your closed plantation shutters will not only give you a nice comforting feel within, but also reduce your vulnerability. As well as acting as a privacy barrier to your home, plantation shutters do make it trickier for trespassers to break in. Think about your windows as one layer of security, and your closed plantation shutters as an extra layer. It is possible for locking mechanisms to be installed to your window shutters, too, giving you that extra piece of mind when you are away from home or sleeping at night. You can arrange for your plantation shutters to fit specifically to your desired room windows. Do you have an unusually shaped window at the front of your property that is more open to the outside world? Arrange for tailor made plantation shutters to be fitted to your window and alleviate your worries. Window shutters are installed to your home to control sunlight, protect against weathering, increase ventilation, privacy and for purely decorative reasons. That said, safety is absolutely essential for your home and that’s where the second security barrier comes in; your plantation shutters. Need more information about the range of plantation shutters suitable to secure your home? Contact us at Vincent Security today on 07 3849 4555.